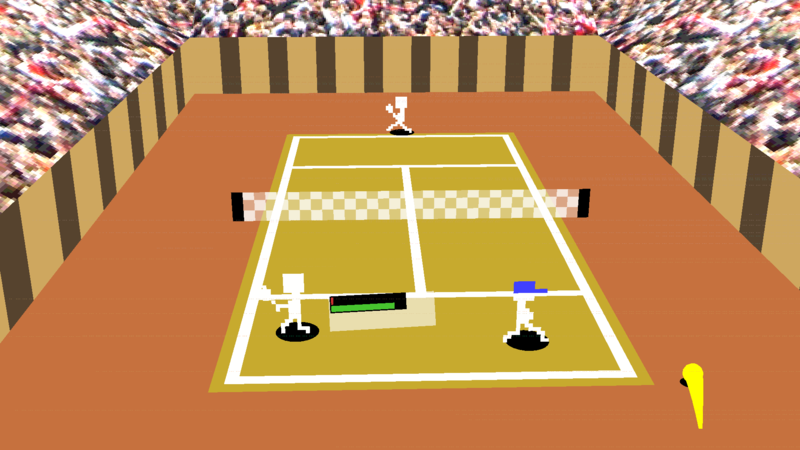 Ace Tennis 64 is an 16-bit-homeconsole-era inspired Tennis simulation originally made for LOWREZJAM 2016 with audio by John Fio. 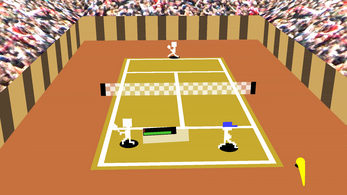 Using a gamepad is recommended, Ace Tennis 64 supports any Direct-Input gamepad. Hey, I love this game! Great concept and execution. I'm curious - how did you make the game and assets? Was this developed in an engine such as Unity, or something more low-level like XNA? Hi there, thanks for playing! The game was made in GameMaker: Studio, though I really wouldn't recommend it for making 3D games, except you really want to go for that very lo-fi look :p.
The visual assets were made in GameMaker itself and Paint.net, and I didn't even use any 3D modelling software back then, but basically placed individual vertices for the models from code. The Audio was all done by John! Wow that's wild. Thanks for the response! Hi - firstly, great game! I'm going to feature it in my new video series about indie games on Itch. 2 - any chance of an update allowing 2 player games? 1 - You should be able to switch to windowed mode by hitting ALT + ENTER at the same time. Although I can't guarantee you'll be able to scale the window appropriately. 2 - Not in the foreseeable future, sorry - Time to work on games is rather sparse for me currently, eventhough I orriginally intended to add a two player mode. Just out of curiosity: Would you prefer having a split screen for two players or have both players share the default view without a splitscreen? Controls were rough on the keyboard. This game looks great. Some suggestions. What about being able to customize the characters and the addition some game modes. Maybe even difficulty modes. Hey, thanks for the feedback, really appreciate it! I originally had the addition of customizable characters and a career + splitscreen mode in mind aswell, but as it proves making a such a (comparatively to the gamejam-version) big game is quit hard (also I'm a bad sprite artist myself). Regarding the difficulty, I actually managed to implemented them! When selecting your opponent, the number of stars flashing up represents their skill-level (I had hoped it would be obvious). 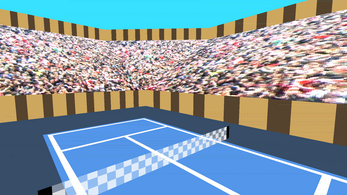 But again, making an AI that is actually fun to compete again in the long run proved really hard. Nevertheless there will soon be a (small) update adding some more ambient sounds by John! Also I'm really glad to see there are people like you caring for this sort of game! 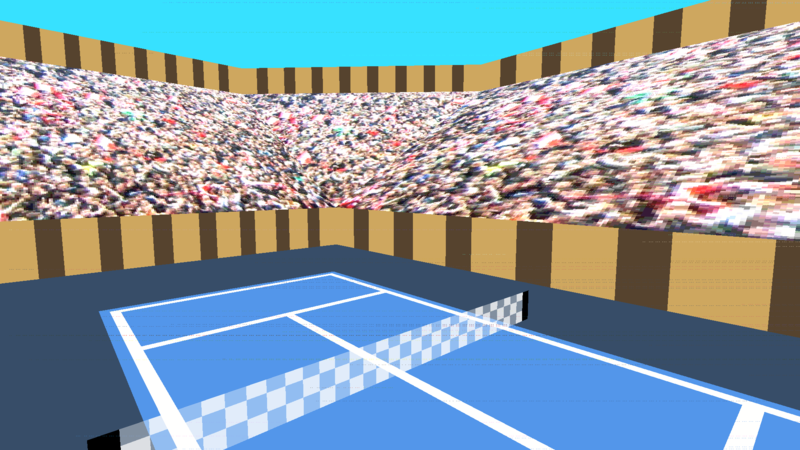 Huge updates aren't likely to happen in the near future or even to the current game, but I'm definitely still willing to make a "bigger" tennis game sometime! 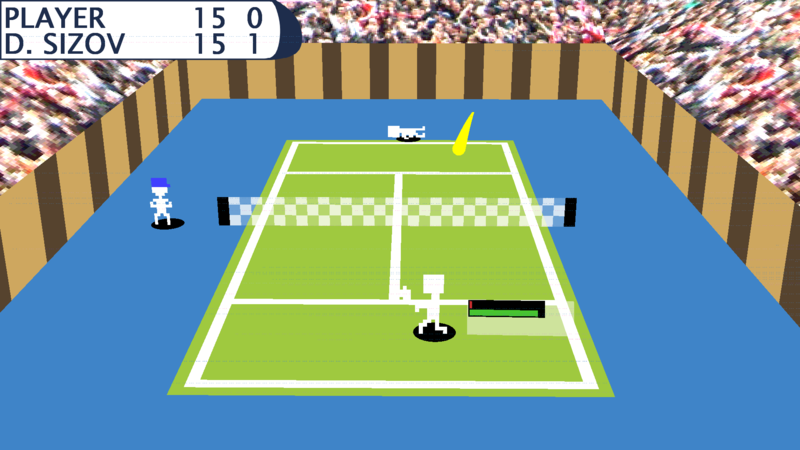 A ''bigger'' tennis game sometime. This excites me. Hopefully the sometime turns to probably. Its overall a solid game. 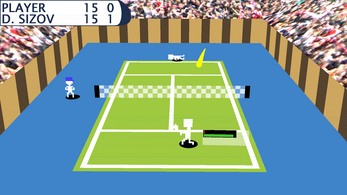 It reminds of the mario tennis 64 and mario power tour game.